Our Beach Front Apartment is typically Spanish in style, set within a small gated courtyard on the first floor with glorious views of the reserve and overlooking the beach. Most of our neighbours are Spanish and spend their holidays here. It also has use of a communal pool with a shallow end for children, within the courtyard. The balcony from the lounge overlooks the beach, a dining table in the lounge and also Kitchen. It has a Double Bedroom, 3 twin bedrooms and 2 bathrooms. A modern kitchen is fitted with dishwasher, fridge freezer and cooker. The large roof terrace is totally private with cloakroom facilities, a shower, chairs and sun loungers, it is ideal for sunbathing, there is a BBQ for your use, it is accessed via communal stairs. Towels are provided for use in the apartment, please bring your own for using on the beach etc. Our Self-catering Beach Front apartments are typically Spanish, whitewash exterior with wood shuttered windows, inside they are comfortably furnished with a modern kitchen and spanish style bathrooms. Both have free Wi Fi. they fish in the salinas to the edge of El Mojon. Both Apartments are set within a small private gated courtyard with a lovely communal pool that also has a shallow children's pool attached. To the left of the apartments El Mojon beach leads onto Higuericas Beach which is a long sandy beach all the way into the next village of Torre Del La Horadada, there are usually 3/4 beach bars here that serve fresh food from Easter to October, (sometimes open 24 hours, lovely to watch the sunset, go for a midnight dip or begin your day early with a coffee and sunrise. Behind the beach there is a boardwalk with a further 2 Bar/restaurants. 8A POBLADO PESCADOR is our 4 bedroomed apartment and is on the 1st floor via a communal staircase, the main entrance leads into a hall with a fully fitted modern dining kitchen to the Left, the hall then opens into the spacious lounge/diner with 4 sofa,s and a dining table and chairs, double doors at the end of the room open onto a balcony with table and chairs. From this balcony you have views of the beaches (25 metres away), the promenade and play area to the right and beyond that the Nature Reserve and Salinas. There are two bedrooms (a double and a twin) off the lounge with a bathroom between them. The other 2 bedrooms (both twin) and bathroom are located just opposite the main entrance door, all the 4 bedrooms have ceiling fans. There is also a large private roof terrace which has a wc and shower room, on the roof terrace there is a BBQ, sun-loungers, chairs and a table also various toys and beach equipment for your use. 5B POBLADO PESCADOR is our ground floor 3 bedroom apartment, it has a patio garden to the front with dining area and off road parking if needed. Again typically Spanish in Style it has the glass doors to the front that can fully open into the spacious lounge. There are 2 bedrooms (1 double and 1 twin) and a bathroom to the left of the lounge. The fully fitted modern kitchen is to the rear of the property with an outside patio/utility area. The 3rd bedroom has a single bed with a pull out to create a double or twin room, the back door leads directly to the courtyard and pool area. There are many lovely walks/bike rides from properties into the next villages/towns including Lo Pagan with its mud baths, and the mar menor lagoon. San Pedro Del Pinitar is a lively Spanish Town, Pilar de la Horadada is also a Spanish Town, Torre de la horadada is a smaller town with many restaurants, a square and bars and ice cream parlours overlooking the marina. From the roof terraces you have views of nature reserve and beach, Higuericas beach is a 3-4 min walk to get on to it. Airports, hire services etc: San Javier (murcia) airport is 15 min drive approximately. Alicante airport is 45 min drive approximately. Bicycle hire is available locally. Golf/leisure: The world famous La Manga Club is about a 20 minute drive. Villa Martin, Los Ramblas and Campoamar are 10 mins drive. Water sports, Diving etc. are available in lo Pagan and neighbouring towns. Numerous Marinas surround El Mojon, there is one at Torre, the next village north approx 30 min walk or one on the nature reserve south again about 30 mins walk. The village and Surrounding Area: El Mojan is located on the edge of the San Pedro Nature Reserve near the Mar Menor, it has 2 supermarkets that are well stocked, and a few locally run Bars and Restaurants, there are more bars open in the summer from easter usually onwards on the beaches and promenade/childrens play area. It is a typical Spanish Resort laid back and relaxing with great beaches. The Mar Menor is the world famous salt water lagoon it is warm and shallow to swim in, like stepping into a warm bath in summer, it starts at Lo Pagan, less than a 5 min drive, about a 20-30 min walk. The world famous healing mud baths are also here. This area enjoys on average 320 Days of Sunshine per year and there are many celebrations and fiestas held throughout the year. A beautiful area to discover. The new 5* Spa Hotel (between El Mojon and Lo Pagan) has opened, it has an amazing thalassotherapy pool and a smaller children’s pool, it also offers a large range of beauty treatments. In the secure courtyard, separated childs area, the pool is closed from 15.30 to 17.30 for siesta time. Lovely, well appointed, spotlessly clean apartment a mere stones throw from the beach as shown in photo. Close to some large supermarkets (car advisable), nice restaurants, promenade. The lovely weather also contributed to making this a very enjoyable half term break - thank you! Total rest and overwhelming sea view and beach. Very Spanish quiet and has everything you need. The property is as described on the site, it overlooks the beach and has a lovely balcony for relaxing or dining, the private roof terrace was very sheltered and perfect for us to sunbathe with a convenient shower and loo facilities. The kitchen is modern and the furniture looked very new, we did not use all the beds but of the two bedrooms we used they were very comfortable and quiet. We loved the beach walks and hired bikes to get further afield, cycle lanes are really good. The local restaurants and bars catered very well for our needs, beach bars were lovely, a Margarita's chiringuita overlooking the park was so friendly and cheap, great to watch the sun set. We will return next year to see more of the area especially the cities of Murcia and Cartagena. A big thank you to Lynne and Steve (the agents) who could not have been more helpful. On first impression we were a bit disappointed as the apartment is a little old-fashioned. Also 2 of the bedrooms are totally separate to the main apartment which would not be suitable for children. Also, the roof terrace is not accessible from the apartment so we didn't bother to use it. However, the property was perfectly clean and well equipped. and we felt that the price was fair. The main apartment had wonderful sea views from the balcony. Nice pool area, but restricted use as most apartments are residential. The area itself was very quiet with just 1 shop and a couple of bars/restaurants. Enjoyed the ten day stay ,not what we expected one bedroom for four across from main appartment ,but we got used to it. Very clean ,linen towels all in good condition. Lynne and Steve who look after the place very nice and very helpful. The apartment however do not supply chairs or umbrella for beach use ,we had three very fair haired children ,so we needed a unbrella for beach use otherwise they would have got burned. I do understand that people can break or leave things on the beach ,but a few chairs and umbrella are very much in need, however lucky for us Lynne sorted it out for us ,otherwise to buy them and leave them would have cost us twenty Euro for brolly and Twent to thirty five Euro per Chair we where a party of seven so the cost would have been high and we would have to leave them ,l do not expect seven or more chairs ,but two would be a great help , otherwise a very nice place to stay and a good all round apartment . Thank you for your comments, I do put 3 times in the details that 2 bedrooms and a bathroom are across the hallway and call it the annexe on the photos so that it is clear, I am sorry if you did not realise the layout. Thank you for your nice comments about the apartment. We do not supply beach chairs, there are sun loungers on the roof terrace as listed in the details, there are umbrella's around the pool area and also sunbeds and umbrellas on higuricas beach to hire as Lynne explained. El Mojon is a typical Spanish village near the Mar Menor, (the famous salt-water lagoon), and the San Pedro Nature Reserve (were you observe many species of flora and fauna). 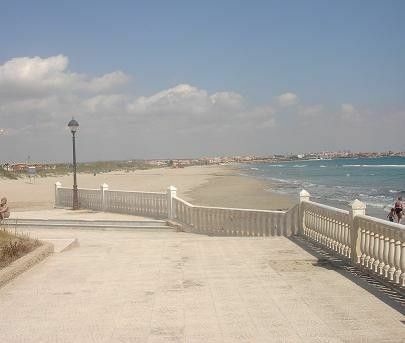 It has clean safe beaches and a lovely promenade with walks leading to the reserve,salt lakes and marina ,(there are a few restaurants on site at the marina to try) or in the opposite direction to the next village of Torre which has a marina and a lovely square and plaza with a few bars and restaurants. In El Mojon there are 5 bars/ restaurants open all year, more open in the summer season some on the beaches, 2 supermarkets and a pharmacy. San Pedro, and Pilar are typical Spanish towns, with its churches and square in the middle, Lo Pagan is on the Mar Menor lagoon, with its cafés restaurants and bars, beach and promenade, all these are about a 30 min walk away, less than 5 mins by car. Local golf courses - Campoamar, Villa martin, Las Ramblas are 10 mins away. Discover the Charm and Beauty of the Real Spain.